Posted on Sat, Feb 18, 2012 : 5 a.m.
Denis Watley, a motivational speaker and writer, said, "The reason most people never reach their goals is that they don't define them, or ever seriously consider them as believable or achievable. Winners can tell you where they are going, what they plan to do along the way, and who will be sharing the adventure with them." That sounds like a good description of bridge declarers and defenders. Winners count losers and winners, work out a plan at trick one, and enjoy watching their partners sharing the adventure. In this deal, South is in four spades. West leads the club king. How should East plan the defense? North's four-club rebid was a splinter. 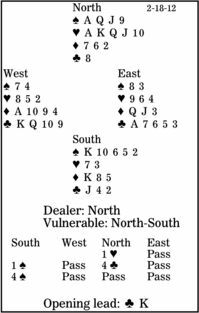 It showed four-card spade support, game-going values and a singleton (or void) in clubs. East should ask himself where four tricks will come from -- the defensive target. Similarly, there is no heart trick coming and only one club. So the defenders must take three diamond tricks. And who should be leading the suit? Clearly East. He should overtake West's club king with his ace and shift to the diamond queen. Here, that works perfectly.